Richard Frajola talks about postal history, discussing covers, stamp designs and markings, and the detective work involved in determining how letters got to their destination in the 19th century. He can be contacted via his website, PhilaMercury, which is a member of our Hall of Fame. I have a stamp collection, but I don’t consider myself a collector. I have a collection of my initials on stamps from Great Britain. I’ve been collecting those for a long time, but I’m a dealer and a consultant for postal history more than a stamp collector. It’s been a passion ever since. I built a collection of Bosnia stamps and covers and exhibited it at an international show in Washington in 1966. It’s been a passion my entire life. I truly love postal history. With stamps, sometimes you get a little jaded after you’ve seen an airmail invert, for example—they are all the same basically. They’ve become commodities, but with postal history, every item is unique and tells a story. My interest has been primarily postal history for a long time. My auctions—which I started in 1981—were all postal-history auctions. I quit that in ’95. Now I just do my website and deal with private clients, helping them build or sell collections. I’ve had Rfrajola.com since about 2001, and I finally started the PhilaMercury site two years ago. The census portion of the site is for anybody who wants to put up covers that they own or have for sale. It can be sorted in many different ways, so a student who’s looking to collect a particular state or town can sort and see what exists in those areas. There are over 12,000 covers posted already. Collectors Weekly: How has your interest in postal history evolved over the years? Frajola: When I started with U.S. postal history, there were maybe 10 or 15 books available on the subject, and most did not deal with the subject exclusively. They were mostly about stamps. Now there are probably 200-plus books. My interest has always been to trace a letter from the hand of the person who wrote it until it was delivered. Did he take it to the post office? Did somebody pick it up at their house? Did he put it in a mailbox? And if he put it in the mailbox at the post office, how did it get transmitted from that point to the next town or country? What ships were available? What routes did it take? One of the things I’ve tried to do with my website is to get people interested in the nuances on the human side of the story of postal history. It’s much easier now, though still complicated, to find that information. That’s one of the reasons I had the board—to have people share ideas and their particular knowledge of a particular country or state or era with other people who may not be as familiar with that aspect. To me, it’s a matter of satisfying intellectual curiosity. I’ve always said the day I quit learning is the day I quit the business, and I don’t see that happening. Collectors Weekly: How do you trace a letter? Frajola: By the markings. For example, a cover for the United States to China in the 1860s would typically have an origin postmark, then it might have a New York transit marking on the back. The day of that marking would be the date that the ship took it to England, and when it got to England, an official in London would mark it with a transit mark, then put it on a steamer that would go through to the Mediterranean. Then there might be another receiving mark when it made it to Hong Kong, or wherever. So you can actually track and figure out what vessel carried each leg of that trip. They used different postal routes. Some people collect by the stamp that’s on the cover, some people collect by the route that the cover actually took, and some people collect for historical connections. For example, there was the Opium War in Hong Kong in 1841, so somebody might collect letters that are related to that. You have mail carried by naval vessels, you have mail carried by mail steamers. There are all kinds of different ways to look at the same artifact. Postal-history collecting is very different from stamp collecting. It appeals to a different kind of person. I always say that stamp collectors collect on a grid checklist. They have a defined goal, and they look at a catalog or whatever and they complete a grid of things. Postal history collecting is more about the intellectual curiosity, trying to understand value and quality and rarity. It’s a different dimension without conventional boundaries. Take the Pony Express, for example. I did a book on the Pony Express recently. Some of the covers shown hadn’t been on the market since 1904, so when those things come up on the auction, you’ve got terrific competition among the people who appreciate them and desire them. You may only have one shot in a lifetime. These postal-history collectors tend to keep things and don’t sell simply because the value may have risen. I bought a cover from the first trip of the Pony Express for $125,000 for a client. Somebody offered him $750,000 a year later, and I said no. He did not buy it for a profit motive. With postal history, it’s very hard to judge value. A lot of the collectors are pursuing the same kind of thing and they realize this might be a once-in-a-lifetime opportunity to own it. It’s a true collector-based market rather than investor kind of market. Stamp collectors tend to think more about investment. They tend to watch how much they pay for things. They’re interested in a particular stamp up to a certain cost, and when it gets beyond that level, then they tend to let it go. When I bid for my postal-history clients, I frequently have buyers with discretion bids. It’s a whole different mindset. They see something and they want to own it, rather than wanting to own it up to a certain price. The stamp prices have gone up and down over the years. There was a big market boom in the 1980s when people were putting them into investment portfolios. Right now, other than the very top pieces, that market is depressed probably 35 percent for what I call routine material that appears at auction regularly. The postal-history market, on the other hand, has steadily gone up without the swings. The material becomes more valuable as the number of people collecting it increases. Postal history pricing is usually too complicated for the guys who are doing it for investment and additionally requires an investment in time to understand the nuances. Most people on the board at my site are pure collectors—you can offer tremendous profits and the stuff will still not be for sale, and it likely won’t be for sale until they die. Right now there are more big-money collectors than ever. A lot of very wealthy people have retired or are nearing retirement. They’re very sophisticated, successful people going after a very small pool of high-quality, rare items. That’s made the market very strong. Collectors Weekly: With covers, do you specialize in a specific era or a specific type? Postmark - August 2, 1854. Origin - Paris, France. Destination: Norwich, Connecticut. August 4, 1954, an Air France Super Constellation with 37 people on board crashed in a potato field in Preston. All 37 passengers survived. Three different handstamps were used, this is one of the three types. 4 Line, Lower case month. Frajola: When some people say covers or postal history, a lot of times they include things like first day covers, which I consider souvenirs. It’s a contrived souvenir, like an Elvis Presley plate or something they sell in Reader’s Digest. When I say postal history, I mean items that were not inspired by stamp collectors when they were originally sent through the mail. I deal almost exclusively in pre-1900 postal history, and ideally pre-1876, which is when the universal postal union started and made all the postal rates to foreign countries at a lower rate. The mail systems became really simplified and less interesting to me after 1876. In 1865, if you sent a letter locally, it cost 2 cents, and for that 2 cents, the post office delivered mail three times a day. And they had Sunday mail. Mail between New York City and San Francisco took approximately 20 days. After the railroad was built, completed on May 10th of 1869, that trip was reduced to 10 days. They had a very rapid mail system, given the technology that they had, which was primarily trains and stage coaches. If somebody in the United States wanted to send a letter to China, they’d consult a publication with the schedules of the next departing steamers—in those days, commerce depended on the mail. There were global networks of interconnected mail steamers. You might have a French steamer that served a particular port and whose date of arrival was the day before the departure of a British mail steamer that continued onward to a further destination. It was extremely well coordinated and extremely fast for the era. In the Roman era, they had cohorts that carried military dispatches. I’ve never seen anything that early; I don’t know that it exists but it might. The Egyptians had a mail service. In the late 1400s, the Venice merchant guild operated posts from Venice to Constantinople. Generally, the earliest mail systems are very uncommon on the marketplace. In the United States, the earliest mail system was 1689 in Boston. By 1711, they had a transatlantic packet service, operated by the British to communicate back and forth. The postal system in the United States expanded greatly with the westward expansion. Wherever you find people moving, the mail system was soon to follow. When there was government mail service, the government gave contracts to carry mail. Usually for the first settlers in an area there was no government mail, so they devised ways to carry it privately. Somebody would say, “Hey, I’ll take your letters for 20 cents apiece to the nearest post office to mail them.” Throughout the 19th century, up to 1865, at least, the government mail service was so poor in parts of the United States that these private companies thrived. Mail carried by them is often extremely uncommon compared to regular government-carried mail. It’s a very interesting little subset of mail. Collectors Weekly: How did the move to the West affect the mail service? Frajola: Private enterprises came in and carried mail for a while, until there was sufficient demand and political pressure for the government to provide better service. The government would then establish mail routes and pay contractors to carry the mail. People on the immigrant trails, the Santa Fe Trail and the Oregon Trail, would give letters to people going in one direction. They had fair trade rendezvous in what is now the River Wyoming area in the 1830s. It was mostly letters from the fur trappers, and there are actually letters that have survived. They were carried back and placed in the mail at St. Louis and whatnot. Hudson Bay Company had an outpost for Vancouver in what is now Portland, Oregon. They had a canoe brigade to Canada, then down to Montreal, and then by water down to Albany, New York to get mail. It’s unbelievable how difficult it was. Mail has always been extremely important. After the Revolutionary War, the United States government made a very important decision to basically subsidize the mail. They realized the revenues would not equal the expense, particularly for things like newspapers, so the government developed an underlying philosophy that it was a good function for them to subsidize the spread of news to the people, so it charged very low postage rates. All that changed after the war of 1812. In 1815, as the war was over, they needed to raise revenue, so they increased the postal rates for a year and called it a war surcharge rate to help the Treasury. After a year, they went back down to their prewar rates, but by and large, in the early days, the government subsidized mail. In California, after the Gold Rush in 1849, transcontinental mail went between New York and San Francisco via Panama by steamer. It took a long time and there wasn’t enough mail to pay for this service, but the government still subsidized it to a very large extent. Post-office subsidies still continue in a sense with all this junk mail. The postal rates for catalogs and stuff are a fraction of the actual cost. I’m not sure what the underlying philosophy is now, but it has been a long-standing tradition. Prior to July 1st, 1845, we had a very convoluted system of postage based on how far away a post office was. Private companies said, “We can do this cheaper,” and pushed the government into lowering the postal rates. They lowered it to 5 cents per half-ounce letter. That was the first time the rates really went down substantially. Collectors Weekly: What was the difference between military mail and regular mail? Frajola: It depends on the timeframe you’re talking about. In the U.S.-Mexican War in 1848, letters could be sent to soldiers for free. In the Civil War, certain types of mail was free, but most was not. For example, a letter sent to a sailor stationed in the Mediterranean could be sent using the England rate, but it was still not free. In World War I, mail from soldiers to friends and family back home was completely free, and I think in the Spanish-American War, no matter where they were, soldiers were able to send mail to anybody anywhere for 2 cents, which was the domestic postage rate at the time. In World War II, mail was also allowed to be sent free. I don’t even know about now. I assume it’s free, but I don’t know. Collectors Weekly: What’s the difference between cover collecting in the European countries and America? Postmark June 3, 1860. 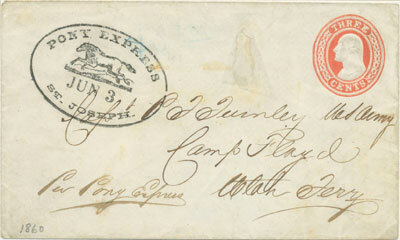 A cover sent privately by Pony Express from St. Joseph, Missouri to Salt Lake City. Frajola: The American collectors seem to be a little ahead of their European counterparts as far as being able to determine rates and routes. A lot of the Europeans have collected stamps on covers. It’s a natural progression. People collect stamps, and then they collect used stamps and they see that they got a cancel from some exotic place, so then they became interested in stamps on covers. Then they realize that there’s a whole other world opening up to them. If they have the curiosity, they expand it from there. To start collecting, you need availability of material and a basic knowledge as to what exists and what’s scarce and uncommon. Dealers can shine light on the areas that might be of interest. In 1990, I handled a collection for Ambassador J. William Middendorf III, a collection of carriers and locals worth a million and a half dollars. It was all government carriers and local posts, which had been an area where there were a lot of forgeries and people didn’t know very much about it. So I did two things: I did a catalog that described the companies with a synoptic overview (it didn’t have a synopsis for each different company), and then I had the material for sale. Beyond that, I started a society. I got about five or six people with a similar interest and we formed the Carriers & Locals Society, which is still thriving. Collectors Weekly: Could you tell us a little bit about canceled versus non-canceled? Frajola: A mint stamp is a stamp as purchased from the post office, if it has not seen postal duty but may have been mounted in an album, or lacks the gum, it is called unused. A canceled stamp is a stamp that’s done postal duty. Usually a lot of collectors want to try to collect mint stamps. I prefer stamps that did postal duty, but people have their own preferences. It gets very expensive very fast to try to build a mint collection of United States material. There are a lot of fakery problems with things that look unused. In the 1860s, there were pen cancels used in many small towns. It’s very easy to clean off a pen cancellation, so you have dealers and collectors selling things as unused that are really used with a removed pen cancel. Like in any collectible, condition is extremely important, especially right now. The market is very specialized and very top-quality items don’t show up on eBay from somebody’s collection in the attic. In terms of cancellations, the big towns all had hand-stamped cancels from 1847 on. The smaller towns were allowed to cancel with pen, so you see both. By 1870, it was mostly hand-stamped canceled, and by 1880, it was almost all hand-stamped cancels because the government was providing devices. Originally the government only provided postmark devices for towns that did a certain amount of distance every year. They gave them devices, and everybody who didn’t meet that standard number of postal receipts had to use manuscript cancels. By 1850 to 1860, canceling devices became very cheap. The government lowered the standards, so they were supplying many more of the offices with free devices. By 1880, it was 10 to 20 cents to buy a device, so most of the offices used them. The real collectors are very passionate, and they go to extremes to try to find information that will help them. There’s a potential for great crossover in knowledge and marketing material. For example, there’s a whole series of advertising covers made by DuPont, the gun-powder manufacturer. From 1900 to 1930, they produced some wonderful series of multicolor illustrated envelopes for advertising. They were relatively common in the philatelic trade. Then, all of a sudden, shotgunners or hunters or who had been collecting shot shell boxes realized that there is this whole other area that they didn’t know about. It’s a completely different market, and they’re buying for completely different reason, and now the price has gone way up. They don’t care about postal history. They don’t care about covers. They’re doing it as illustrated Americana in their thematic collection of guns. Collectors Weekly: What are fancy cancels? 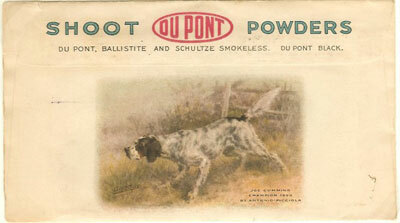 Reverse of 1917 DuPont Powders illustrated advertising cover with an English Setter. Frajola: Fancy cancels are a subset of cancels. Particularly in the 1860s, the postmasters used wood devices to cancel their stamps. The government gave them steel devices in the 1860s in the bigger offices. Mainly the small offices used cork wood cancels. Some of the postmasters decided to carve interesting things in those wooden devices. Some of the most famous ones are the ones from Waterbury, Connecticut. Hill was the Waterbury postmaster, and he was a prolific carver. He carved soldiers’ heads, women on barns, running chickens. One of the most famous U.S. covers sold for $230,000, a record, and it was a running chicken that he had done. They’re wonderful Americana. There was a group of covers that was donated to the Mattatuck Historical Society in Connecticut, and they gave it to me to auction. They had three of these running chicken cancels and a bunch of other covers, and I tried to get the museum of Williamsburg interested because they have very fine primitive American art at the museum. Some of those covers were worthy of a museum to show patriotic sympathies. For example, at the start of the Civil War, there were all kinds of waving flag designs. I have one collector who collects nothing but cancels with flags on them. There’s that many of them to collect. So it’s a whole subset of very interesting material and it’s very visual. A lot of collectors don’t care so much about how a cover was handled or mailed; they have a visual attraction to the design and the propaganda that they printed on covers. They had advertisements and political slogans. I recently saw a Lincoln campaign cover with a stamp on it, and the postmaster was obviously anti-Lincoln because he smashed on Lincoln’s head with his cancel device and smashed at all the Lincoln references 10 times. Obviously his sympathies were elsewhere. During the Civil War, you got these wonderful patriotic designs that were used from 1861 to about 1863 that were primarily sold to soldiers and families of soldiers, which was a large chunk of the population. Some people collect patriotic covers [see photo at top]. You may have one with pictures of generals. You might have ones with flags. You might have ones with naval vessels. There’s a broad range of subjects. The confederates didn’t have as many designs. They had probably 50 designs as compared to 2,000 generals, but you have confederate flags and regimented designs and all these wonderful visual themes that people can collect. Collectors Weekly: In terms of the designs on stamps, were they initially mostly patriotic? Frajola: No, the designs mostly reflect what was politically in favor. 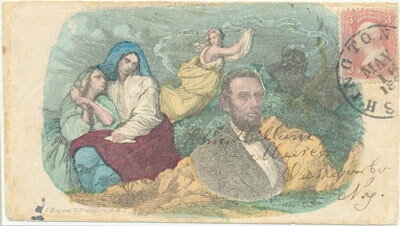 Stamp designers originally picked images of Franklin and Washington. In 1847, those were pretty safe to use as design objects. In 1851, they continued to use Washington and Franklin, and then 1856 they added Jefferson. The English stamps all had Queen Victoria, and most of the foreign countries had either emblems or actual images of kings or queens, so that became like a trend. You really didn’t get political themes on stamps at all. They had the Columbian Exposition in the United States in 1893, so they did this series of stamps to commemorate that. Some people just collect commemorative stamps. The Columbian Exposition was in Chicago, and those stamps were the first commemoratives issued in the United States. They issued a stamp in 1866 of Abraham Lincoln in black that some people considered to be a mourning design because it was printed in black. At this late date, I can’t judge what was in the designer’s minds. I don’t try to speculate because it’s hard to know, but some people consider that a commemorative design. Some of the other foreign countries started producing commemorative stamps at roughly the same time. There was a Spanish series for Spain and their colonies in 1892, and that practice continues to this day. We never used to issue so many stamps in the year, by the way. Even in the 1960s when I started collecting, they were issuing maybe 10 or 20 stamps a year, and they were all 5-cent stamps or 3-centers. Last year they had some enormous number, like 120 stamps or so. It’s crazy. I’m concerned about the future because they’re going to these self stick stamps which you can’t soak off of a cover. Plus if somebody wants to buy a mint set at the post office, it costs more. In the old days in the 1950s, there were dealers that promoted current U.S. stamps as investment. I can’t tell you how many times I’ve been called by people who have sheets and sheets and sheets of 3-cent stamps. Right now, dealers usually buy those at 70 percent or less of face value because you can’t fit enough stamps on the cover to use them all. I’ve got tons and tons of these old stamps that are just too hard to use for postage. A lot of people lost a lot of money putting it away in sheets. Collectors Weekly: Are the Lincoln stamps popular among collectors? Frajola: There are a lot of people who collect Lincoln. I just sent some extra catalogs to a client in Germany who collects Lincoln. I said, “What are you collecting Lincoln for?” It’s pretty funny what some people collect. For example, some of my best collectors for Pony Express and Western Express material are Italians and Germans. I invariably ask them why, and it’s because when they were kids, they watched all these spaghetti westerns on TV, and they’ve always been intrigued by the American West—anything to do with Indians and cowboys and the Pony Express. To give you an example of what you can find in postal history, there are certain well-known covers. One famous one is addressed to a member of Custer’s regiment in North Dakota. It has big marks on it and it was sent back to England without reason for non-delivery. The intended recipient was killed at Custer’s last stand. It’s absolutely amazing to find a stock like that. This becomes an artifact that is an excuse to tell the story of Custer’s Last Stand, for example. Here’s something physical, an artifact that relates to a particular event in history that we can use to learn about ourselves and then to talk to other people about. Collectors Weekly: What are first-day covers? 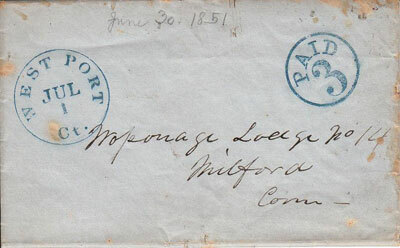 A July 1, 1851 cover from West Port, Connecticut used on the first day of the new, lower three cent postal rate. Frajola: First-day covers have an importance in the early period because they can document when a stamp was issued. We may have no firm data about the stamp that’s first issued, and by finding it on the earliest known cover, you can try to figure out when the stamp was actually issued to the public. Those kinds of first-day covers have historical importance to document the distribution of the stamps. In the old days, they postmarked covers on the day they were transmitted. Now the government creates souvenirs to make money, so let’s say there’s a stamp that was issued January 1st of this year. They’ll take orders for first-day covers from collectors until June of this year, and they’ll postmark them. They backdate the postmarks January 1st, so there’s no way of telling whether the cover was actually mailed on the first or even when it was first printed. It used to be you could tell, “Well, if there’s a postmark on the day it was issued, it’s got to be the first printing.” They do this nonsense now for six months, and it has absolutely no bearing on the post office at all. It’s just a commemorative souvenir. I consider the backdating of postmarks to be fraudulent. They’re not true dates of use. They were done to deceive people into thinking that they’re something other than what they really are. It’s not even stamp collecting to me. The best collection of that stuff ever formed was by one of my clients. I helped him build an exhibit collection of classic first-day covers from 1844 to 1916. They were legitimate first-day covers, and some of them are exceedingly rare and valuable. He sold that collection for $4 million or $5 million. Those are true “first-day covers.” It meant that somebody went to the post office and actually used the stamps on that day because they happened to be first issued. Collectors Weekly: What about revenue stamps? Frajola: Revenue stamps were issued to show that tax had been paid and are highly collectible. A lot of people collect them on the original documents, which is basically akin to postal history. They’re very popular. The first several issues have all kinds of hand-stamped cancels that people can identify by the companies. They’re a great find, and a lot of them are very attractive. It’s a good collection area. The one area of revenue collecting that I don’t like—and again, these are my personal prejudices—are these duck stamps that they’re doing now. They started in 1934 and the face value was $1 each—now $15 each. There are dealers who basically control the markets. The shenanigans going on are driven by dealer greed. I don’t like that. They were sold to produce revenue for the government, so they’re revenue stamps. The dealers sell a lot of them to the duck hunters, and you’re supposed to sign them and glue them to your license. Well, now they probably use plastic sleeves so they can protect them, so they have value after they’ve served the intended purpose. I don’t understand it at all. But other than the duck stamps, I really like revenues and highly recommend them. They started during the Civil War to raise additional revenue to finance the war. They were issued in 1862 so anybody who had a legal transaction had to pay a certain percent as tax. There was revenue embossed paper for checks where you had to pay a tax for writing the check. Those series of stamps, especially the very high denominations, can be quite rare. Some of them are beautiful. One of them is called a Persian Rug. It’s a $500 stamp with an ornate rug-like design framing a portrait. They were very large, 4 inches by 2 inches or so, and multicolored with beautiful engraving. One of those $500 stamps recently sold for $75,000 or so. Some of them are just stunning, and other denominations exist with inverted centers. Collectors Weekly: Can you tell us a bit about airmail stamps? 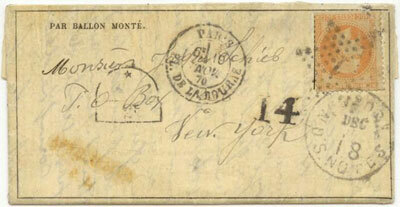 An 1870 cover flown by balloon from besieged Paris, addressed to the United States. Frajola: Probably the most famous of the U.S. stamp errors was issued in 1918. There was one sheet that was printed in red outside with a blue central vignette of an airplane, and there was one sheet found in New York with the blue upside down. They fed it into the machine in two different passes, one printing to the red and another printed the blue. There’s an Air Mail Society in the United States. Most of what they do is collect the different flights. Before the regular airmail was inaugurated, they had air shows where the postmaster allowed aviators to carry contract mail. They’re called pioneer airmails, and those are very widely collected and very interesting. One of my clients has a collection and he’s only missing one flight to complete it. He’s on the road to completion for the first time. In 1918 the government started carrying regular mail. You could pay a premium like express mail now. Like what they did with the railroads, they gradually expanded the routes. Originally it was Washington, D.C., Philadelphia, and New York. Lindbergh carried mail in the 1920s. So people collect them by the routes. They collect transatlantic airmail routes or routes to Asia. That was very popular starting in the 1920s. It’s a huge area. Dirigibles also carried mail. They went to Germany, throughout Europe, and primarily through the United States and down to Argentina. Collectors would send mail to be carried by the zeppelin on any one of the different flights. There’s the Hindenburg disaster in Lakehurst, New Jersey in 1939. They recovered the mail and put them in these black whole body bags, these cellophane envelopes, and then they were delivered to their recipients. Most of the mail that was on that Hindenburg has burn marks and whatnot. So mail exists from all kinds of these airmail trials and services and even some of the disasters. Collectors Weekly: Mail survived through disasters? Frajola: Yes. Mail was very important. Somebody did a book on how many pieces survived from the Hindenberg. There are probably 50 pieces that are in philatelic hands now. It’s amazing what survives from some of these things. In 1871, France was under siege by the Franco-Prussian Army, so they set up balloons with mail. That’s all that was in them. Sometimes they got captured; sometimes they didn’t. They did this for two or three months. But there are thousands of things that survived. There are thousands of these balloon letters alone that survived. That’s really amazing when you think about it. A lot of military mail, like letters from the Civil War, survived. There are tons of particularly human Civil War letters that survived because families saved them. Especially in New England, you get families that save mail forever, and then they sell it to the philatelic market. You also have commercial mail that they saved, and that was how they kept track of their businesses, these large commercial firms. Fifteen years ago, roughly 120,000 letters were found in the archive of a pharmacy company in New York. That stuff had slowly gotten on the philatelic market now. It’s amazing what has survived. When I started in the 1960s, there would be a major find maybe every other year. Now it’s probably down to every seven or eight years. One of my early sales was a collection of Pony Express that was from a warehouse in Brooklyn, New York. It had been kept intact since the 1860s. They had some flood damage and decided to clean everything out, and the lawyer handling it knew enough to realize that this stuff was likely to have value. A special service operated between San Francisco and Virginia City, Nevada for the Virginia City Pony Express, not the same as the Transcontinental. Before the Brooklyn find, there were 40 covers known. After Brooklyn, 50 more covers came to light, so it more than doubled the number of known covers in one shot. Collectors Weekly: What’s driving postal collecting these days? Frajola: People who realize that these artifacts exist but that they’re not all in museums yet, as well as people in an economic position to be able to afford this stuff. Many people are revisiting their stamp-collecting interest from their younger years—they’re looking for something more intellectually challenging. The postal-history shows and exhibits are very interesting and accessible to the public. Most of the best material is handled privately or at auction; probably more at auction now for the expensive stuff. For somebody coming into the hobby, it’s probably a very good time to find pieces because you have access to way more material than you used to. Routinely, I’m following auctions from several different countries that are coming up, plus other ones that are available on the Internet, so I have access to a wide range of material. Invariably the good United States material costs less at sales in Europe than it does in this country because the Europeans don’t concern themselves much with the nuances of U.S. postal history. A collector who’s willing to invest the time to learn what’s good and valuable can find great bargains on things that are genuine. That’s the other thing I like about the hobby is that you can really accumulate a level of knowledge that goes well beyond the dealer’s. If you do your homework, you can amass a collection that is worth far more than what you paid for it. You can use your knowledge to benefit yourself. That’s because there are no catalogs that tell you what you should be paying for a particular item. If you’re willing to invest the time, you can learn and make that pay off. At a Cleveland show, I bought a very innocuous-looking cover from 1859 and a manuscript postmark. The dealer had gotten it from a family in Ohio, and he looked on the Internet and actually found one of my websites where I listed it, and he realized that it was good, so he marked it up from what he paid. I was able to buy it at a fair price because I know that there’s only one other cover known with that mark and I know four guys who want it. So using the knowledge I have of that item, I was able to pay for my trip, plus a little bit. Collectors Weekly: Do you see the hobby growing? Frajola: I think segments of the hobby are growing and some segments are not. What scares me most is that I don’t see enough young people, but everybody’s been complaining about that for generations. There are some very good young collectors. I mentored two of them that are now in their late 20s. One of them went into business and the other is a collector. When I came up, there were probably 50 people my age in the business. Now there are very few people in their 30s in it, and that troubles me. The good news is that there are a lot more women collecting postal history now than there used to be. When I was young, stamp collecting was almost like a tradition. My sister had a stamp collection because my grandmother would pick up stamps or save them on envelopes and give them to her. It was a good way to learn geography. They don’t teach geography in schools any more, and as near as I can tell they’re not very good about history either, so I think we have to be proactive. One of my friends took a George Washington letter with a postmark into his daughter’s grade school class to show the kids a real artifact. You have to spark people’s imagination. There’s not much to spark a kid’s imagination these days. The first time I saw a Bosnia stamp, I said, “What the heck is this? I’d never heard of Bosnia.” Now, maybe because of the war, most people know, but in 1960, nobody knew where Bosnia was. It’s very hard to find ways to engage people under 20. Coins seem to be far more accessible to kids because it’s something they use every day. Stamps are less so. Plus, you can’t get these newer self-adhesive stamps off envelopes. The post office doesn’t particularly want you to collect a used stamp; they want you to buy their mint product and not use it. The coin collectors have a younger profile than the stamp collectors. It used to be absolutely equal. I collected coins when I was a kid, too. Now the young coin collectors far outnumber the young stamp collectors. That’s one of the things that I would love to be able to help change. Collectors Weekly: What attracted you to the Bosnia stamps and covers? Frajola: The time I looked up Bosnia in a catalog, there were 65 different stamps. Most other countries had many more stamps, but Bosnia only had 65. Then I realized that the stamps had perforation varieties, so I started collecting the perforation varieties. Then I looked for proofs, and then I tried to find them on covers. Bosnia first issued stamps in 1879, and they were issued until 1918. Archduke Franz of Austria was assassinated in Bosnia, which started World War I. Before that, Bosnia was basically a dependency of Austria in terms of stamps, and before that it had been part of the Turkish Empire, so you can find Turkish stamps used in Bosnia if you can recognize the town names. When I exhibited as a junior in 1966, my pride and joy was one of these stamps with a Sarajevo, Bosnia cancel on it in Arabic. I went to the show and I met a man who collected those Turkish stamps used in Bosnia on covers. He had maybe 40 covers, and I was just, “Wow. Where did you find this stuff?” So that’s really what hooked me on postal history. I had a little U.S. stamp collection that was worth very little that I sold right away and started buying covers. Collectors Weekly: What’s the difference between perforated and non-perforated stamps? Frajola: It was just technology. It was an easier way to separate stamps, using hole-punches between the designs instead of cutting apart with scissors. It was first done by the Brits in 1853 or ’54, and then by the United States in 1857. They quit making imperforated stamps a long time ago. The era for imperforated stamps is 1840 to 1860, generally speaking. Most everybody converted to perforated stamps after that, although there are some exceptions. Usually perforated and imperforated stamps don’t have the same design. In the United States, the 5-cent stamp in 1856 was issued imperforate. That’s the stamp I wrote a book on—the 1856 issue. In March of 1857, they started printing a perforated version, and it was in use until 1861 at the start of the Civil War. So the perforated ones are very common and the imperforated ones are very rare, and they used the same plates to print them. That’s an exception where you can find the same stamp perforated and imperforate. In the United States, they usually have different designs for perforated because when they originally printed them, they were close together. For perforated stamps, you need more separation between the images. You had to use a different size sheet, so you might as well use a different design, too. They changed the sheet size marginally. If you had a sheet that was 10 stamps wide, it was still 10 stamps wide. If you added a bigger gutter between each impression on the sheet, you might add a half inch to the total sheet size, so if you’re going to change the design, a lot of times you had to change the gutters, and a lot of times they switched over to use new designs. In the United States, actually, they changed the design because of the Civil War. There were massive quantities of U.S. stamps in the southern post offices when the war started, and they didn’t want those stamps being used in the north, so they issued a whole new set of stamps and demonetized the 1857 issues. They didn’t want the confederacy to have the monetary gain from the stamps that were on hand, so they used a whole different design. Collectors Weekly: Are there any collectors clubs and associations you can recommend? Frajola: There are several good societies for more advanced collectors. The U.S. Philatelic Classic Society is excellent. They publish a very good scholarly journal. For beginning collectors, you have Linn’s Stamp News. There’s also Scott Monthly. But for anybody who’s advanced, I would say U.S. Philatelic Classic Society is a must. I was raised in Columbus, Ohio, and we had a local stamp club. Everybody there and was very happy to help me. We have physical tools that we use, tongs and whatnot, and the people showed me how to hinge a stamp, how to mount it, and how to use a catalog. So there is some mentoring, and you can’t get that off the Internet. You need personal contact. For a new collector, the best thing is probably to go on the eBay chat board or my chat board and ask questions. People are very helpful as long as the post is not just interested in trying to sell stuff. I wrote a little article on my site someplace about selling stamps on eBay, because 95 percent the people that ask questions just want to know what something’s worth so they can sell it or how they can sell it. They’re not interested in the hobby. They’re just trying to convert something that they know nothing about into cash, and they invariably think it’s worth a ton of money. But old does not necessarily mean money. For example, the first stamp from Great Britain was printed black and the second was printed red: you can buy the red stamp for two bucks. They’re very old, but they’re common, so they’re not valuable. It’s quite late and the article was very interesting and I should read it tomorrow. What I understand is that after 1847 hand cancellations were being used. I have an envelope with salem hand stamped and so that envelope is probably around that time period? For an example of a great postal collection, as well as a collection of history through the mails, see the Floyd Risvold collection which will be sold by Spink / Shreves at public auction on January 27-29, 2010. Another excellent in-depth interview. Very informative! Dear Sir: Back in 1997 I purchased a set 0f eight “free letterfront”mailings from Benham company in the UK I was advised that these mailings were introduced before the penny post in 1840 and if signed on the front in the lower left hand corner would be sent free by the mailing person usually aristocrats (members of parliament /state officials etc) most of the fronts are appox’ 168 to 176 years old and do have red CDS with royal crown and date one front for example is hand stamped FREE 18JY18 1831 . I paid approximately $70.00 for the eight fronts , can you advise if the value may have increased over the last 13 years . I am looking forward to your comments and response , Thank You. Sincerley. T Martin. Windsor CT.
Free mail in Great Britain was introduced very early and the first postal markings on such mail date from 1764. Collecting autographs was very popular in Great Britain in the 1840s-1860s. As a result many seekers requested franked covers from members of Parliament, etc and unfortunately they saved them by cutting down the address leaf or cover and pasting into albums. So, what you have are “fronts” of the whole letter rather than the intact item as transmitted by the post. The value is largely determined by the importance of the person who signed the item. IF you purchased at around $10 each from a British company as I assume you did, the seller probably sold you examples signed by less prominent individuals. As a result, they are probably worth now about what you paid and maybe somewhat less depending on quality and how badly cut-down they are (meaning how much of the address panel is still there). This is a very informative interview by Ms Keane for me , a neophyte stamp collector from the Philippines. Study of Postal history of a country is so interesting, to research and collate the story that is a history. My kudos to Mr. Richard Frajola. Thanks. Around 2001 if I recall, eBay had a very pricey CSA (Confederate States of America) cover which the seller had altered, and Richard Frajola actually got eBay to HALT the online bidding before it reached the tens of thousands of dollars. Turns out Mr. Frajola could PROVE that the cover had been altered, as he had photos or scans of the cover BEFORE it was altered. This made front page Linn’s Stamp News headlines (again, around 2001), but I cannot find ANY records or data regarding Mr. Frajola’s valient deeds in saving the highest bidder from becoming yet another of eBay’s many fraudulent yet tolerated sellers’ countless victims. Any links or info would greatly help many many collectors!